View a YouTube, use dishwasher safe DecoArt® markers to add tangles to glass and ceramics. It is so easy to make a great gift. Not sure how many times I have said this… but it bears repeating. Zentangle inspiration is everywhere! Especially prevalent in products at the Craft and Hobby Association Trade Show I recently attended in Anaheim, CA. Not only stencils and stamps that use lots of unique pattern designs but a lot of companies now have their own version of repetitive line drawing or “doodling”. More and more books are being published, marker companies are picking up on the trend as well as other manufacturers. It’s a tangled world. 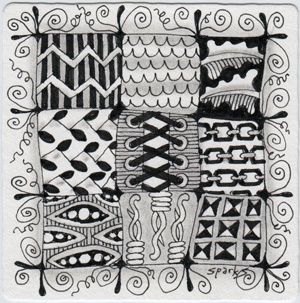 I have really seen the art of repetitive pattern designs resurge since the introduction of the Zentangle® drawing method to a wider audience some years ago. This year at CHA I was pleased to host a “Beauty of Zentangle” workshop for retailers, I also did a few Zentangle make and takes at the Design Originals booth to promote ‘Zentangle 9 – Color with Mixed Media’ and ‘Zentangle 10 – Origami and Paper Crafts’... each book not only features new tangles but other ways to incorporate tangles into your art. DecoArt has introduced some fabulous markers for glass and ceramics… perfect for adding tangles to mugs, plates and many gift items. 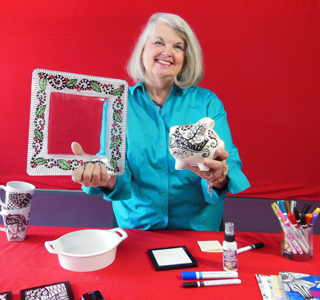 I had a fun time in their booth doing Zentangle make and takes on ceramic tiles. These great markers are easy for anyone to use, and bake in a home oven to make permanent tangles that are dishwasher safe. I hope you’ll take a moment to look at this week’s YouTube video. Penny Raile CZT #2, Nancy Javier, Barbara Finwall and me CZT #2. 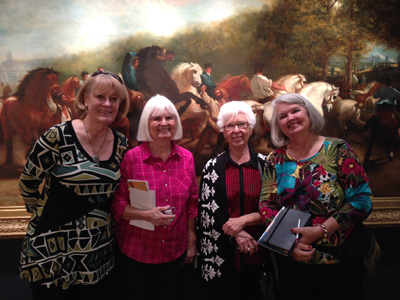 While in California I took the opportunity to visit with friends Penny Raile, Nancy Javier and Barbara Finwall. 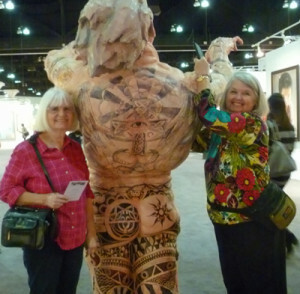 We spent a whole day at the Los Angeles Art Show held every year. New artists as well as famous artists are exhibited here… tons of inspiration. 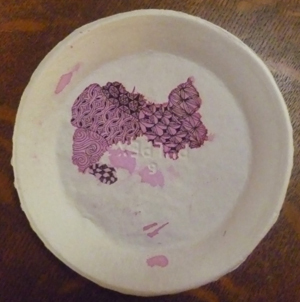 Zentangle was on our mind of course… during lunch Barbara noticed a beautiful pattern of purple beet juice on her plate so she got out her Micron and tangled on it! Nancy and I fell in love with this big guy!